I mentioned in my last post that there maybe some big news heading your way,well here it is. Despite saying it would never happen again, I've entered The Manx Grand Prix this year. 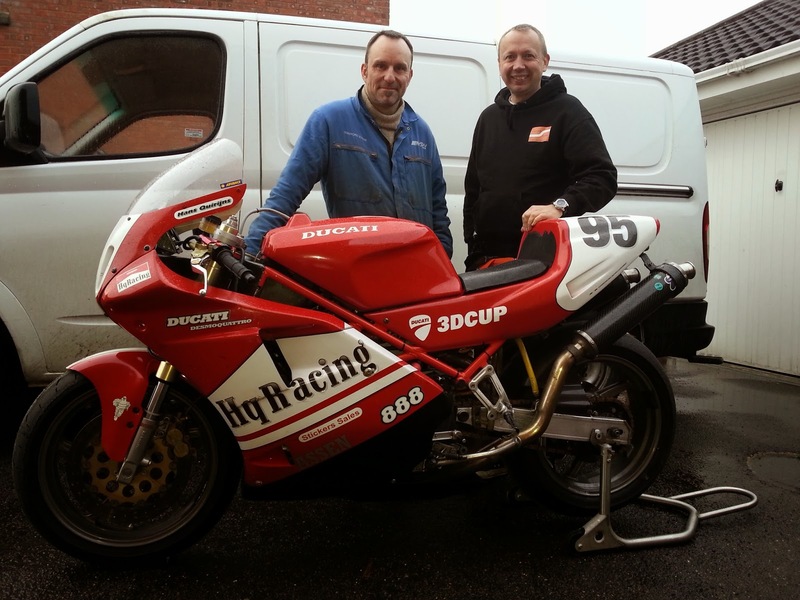 This was all down to an offer by my good mate Stafford to race a Ducati 888 in the Classic TT in August. So as long as my entry is accepted I will be racing the below bike, all being well. As a lot of these things go, it all started one evening whilst in The Creek Inn, Peel, during our visit to The Manx last year. Luckily this idea didn't disappear and was more than a drink induced dream. So after much searching, Stafford found a suitablebike for sale, albeit in Belgium. The bike was delivered a couple of weeks ago and I finally got to see her last week. I only popped over to have a look and was told that once the pictures were taken, the bike would be stripped down as the engine was due to go to Louigi Moto the following day to be rebuilt before the race. I got home at midnight, but the bike was stripped and ready for work to begin. Stafford has started a blog on the rebuild celeresracing.blogspot.co.uk so I'll let him tell you whats going on with that side of it. I'm really excited to be given this opportunity and can't thank Stafford enough, it's been a dream of mine to race a Ducati on the Mountain Circuit for many years so am looking forward to racing on The Island again, but naturally quite nervous after my last trip. I have started watching on board laps again to remind myself of where to go and what lines to be taking so hope this will help after my 14 years away from racing there. As always my ambitions for racing there are to qualify and finish, anything else is a bonus. I'm not counting my chickens just yet as we have to get an entry first, I'll let you know just as soon as I do. So hope to have some good news for you soon. New loom on order Stu, lets go racing.